SHOW ME THE MONEY! $5,000 Grant from Lowe's!!!!!!!!!!!!!!!!!!!!!!!!!!!!!!!!!!!!!!!! Hannah Robbins, Andrew Johnson, and Ethan Garza won Runner-up for the 10th - 12th grade category in the I Heart Robots: Engineering Design Challenge with the Oak Ridge Institute for Science and Education! Allison Jett won Judge's Choice in the same competition! Thank you CTE Director Lance Duff for our new Haas CNC Machine! 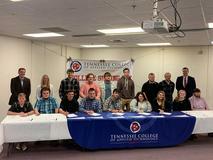 Oliver Springs High School is proud to announce that 96% of our students have the opportunity to participate and earn an Early Post-Secondary Credit/s through Dual Enrollment, Advanced Placement, Middle College, and Industry Certifications.